To help achieve its ambitious goal of funding anywhere from 20 to 50 projects annually, Ultra Capital requires a systematic investment process. That’s why, in 2016, the firm purchased a financial-modeling software company called EverVest. “Anybody who’s seen it, literally their jaw drops when they find out what we can do inside of it,” says Ian Copeland, CIO and managing director at Ultra. The software uses Monte Carlo simulations—algorithms that apply random variables to determine the probability of certain outcomes. Leveraging cloud-based computing, the software can generate more than 10,000 unique simulations of a project’s future performance. “That allows us to actually understand what’s happening in the project and where the biggest returns come from,” Copeland says. The software’s creators, MIT alums Teasha Feldman-Fitzthum and Mike Reynolds, are now directors at Ultra. The technology is based on one of Feldman-Fitzthum’s research projects from MIT’s Computer Science and Artificial Intelligence Laboratory. Copeland emphasizes that the software does not make investment decisions for Ultra, but it does allow the firm to understand investment opportunities better and faster than typical financial analytics. With the software, the firm can take a project developer’s financial model and analyze it in an hour or two. Without that technology, it could take anywhere from 15 to 40 hours, Copeland says. 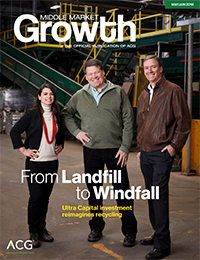 Read more about Ultra Capital, the subject of MMG’s May/June 2018 cover story. Human fallibility can also overestimate an investment’s future payoff. “The worst analysts are ones that say to you, ‘The project has a 14.73 percent return.’ That’s not true,” Copeland says. “The project has a return somewhere between X and Y with the highest probability of it being about a 14.73 percent return.” That speaks to one of the firm’s financial maxims: We’d rather be approximately correct than precisely wrong. This story originally appeared in the May/June 2018 print edition of Middle Market Growth magazine. Read the full issue in the archive. S.A. Swanson is a business writer based in the Chicago area who frequently covers technology.